We put builder’s grade mirrors go in when we were building Old Salt Farm, knowing that framing the mirrors would be on our list to do once we moved in, and it would save us a lot of money. They are finally finished, and I’m in LOVE! 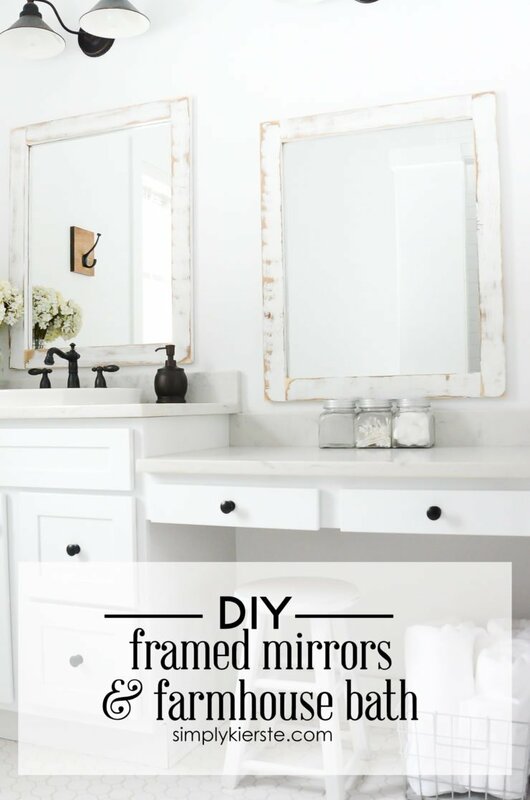 It’s completely amazing the difference that just adding these easy framed mirrors will make in your bathroom. 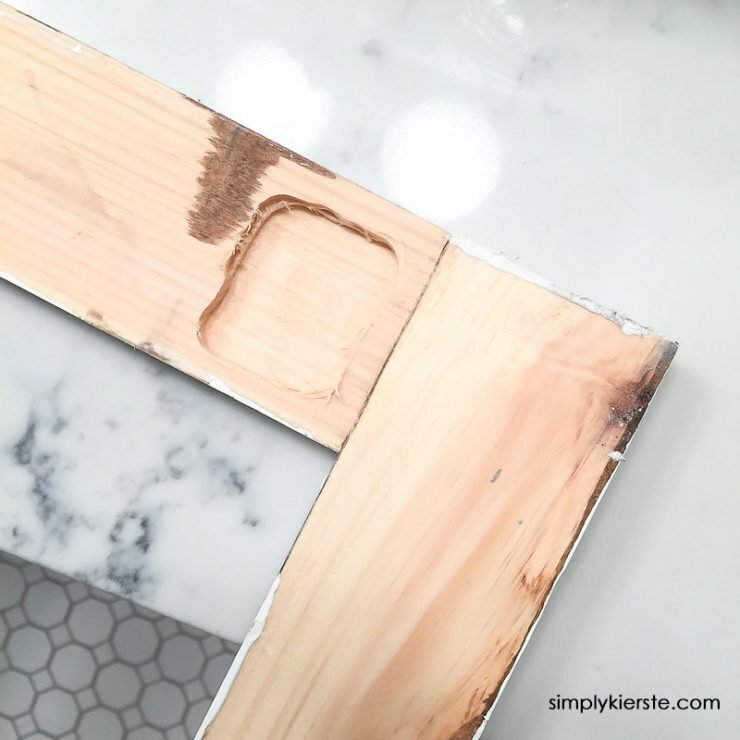 If you’re looking for an inexpensive way to update your bathroom, framing your builder’s grade mirror is a great place to start! This ended up being about a 1-2 day project, but only because we had to wait for both stain and paint to dry. 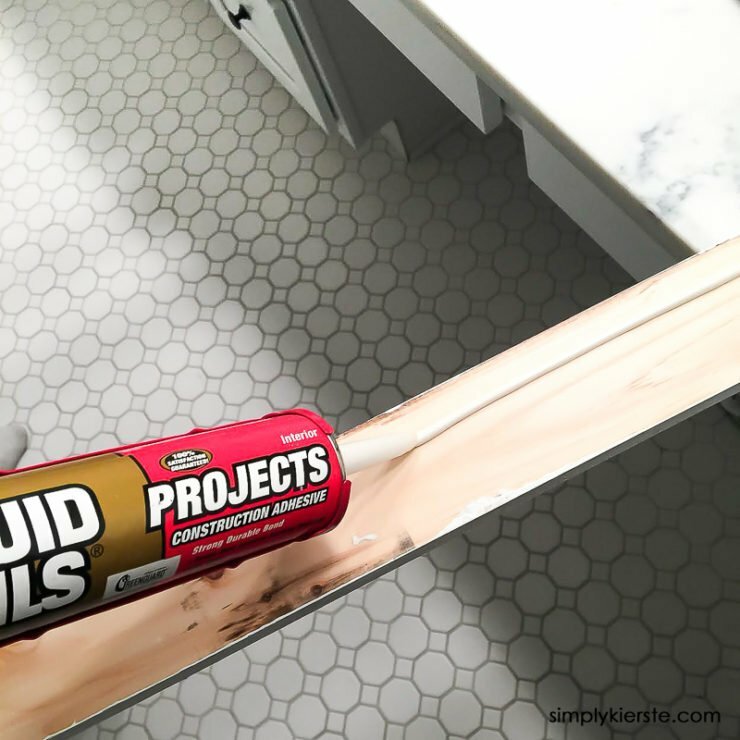 If you’re just staining or just painting, it will be a little faster. The cost is very reasonable–less than $20 for each bathroom. -I used 1×4’s (which are really about 3.5 inches) because my mirrors aren’t very big, and any wider wood would take up too much of the mirror. If I had a really large mirror, I would have done 1×6’s instead (around 5.5 inches wide). -Some of them I stained only, and others I stained, then painted white and distressed with my sander. You can do anything you like–colors, stain, etc. -You can miter the edges of your wood so that they meet diagonally in the corners, but I like mine straight instead. It’s also much easier to do it that way. -The wood sits directly on top of the mirror, not to the side of it. -1/2 inch straight bit to cut out a space to go over the plastic clips holding up the mirror. -Cut your wood to length. Measure the sides first, which is basically just the height of the mirror. The top and bottom pieces will be cut to fit the remaining space in the middle. 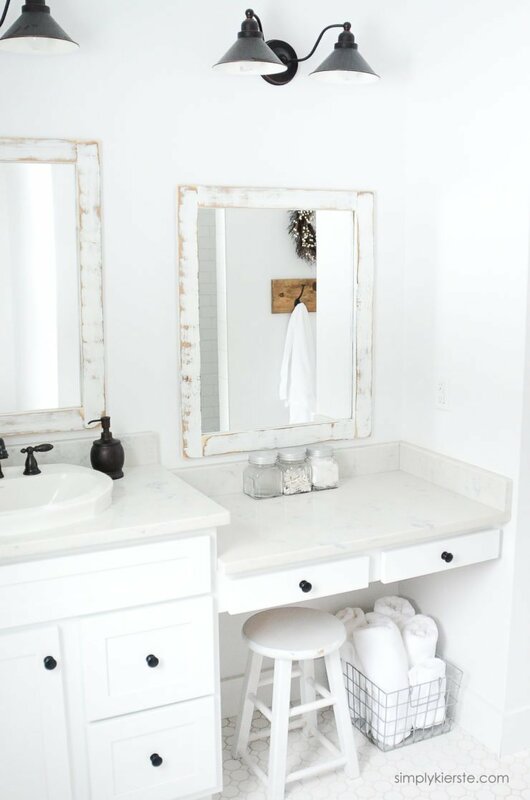 For example, if your mirror is 20 inches tall and 20 inches wide, your side pieces would be 20 inches, and the top and bottom pieces would be 13 inches each. The side pieces will each have a width of 3.5 inches, so a total of 7, which you subtract from the mirror width of 20. Just make the number changes for a different size frame and wider wood. 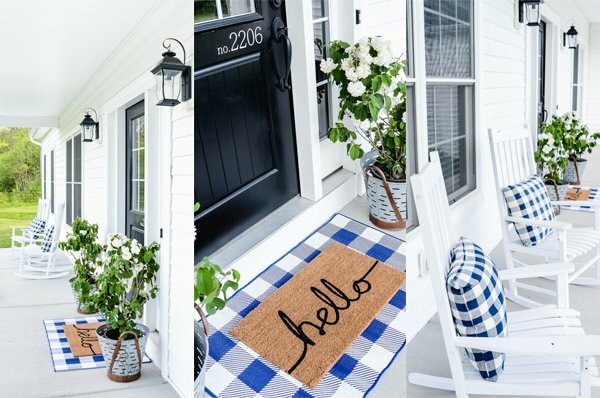 -Paint, stain, sand, etc. 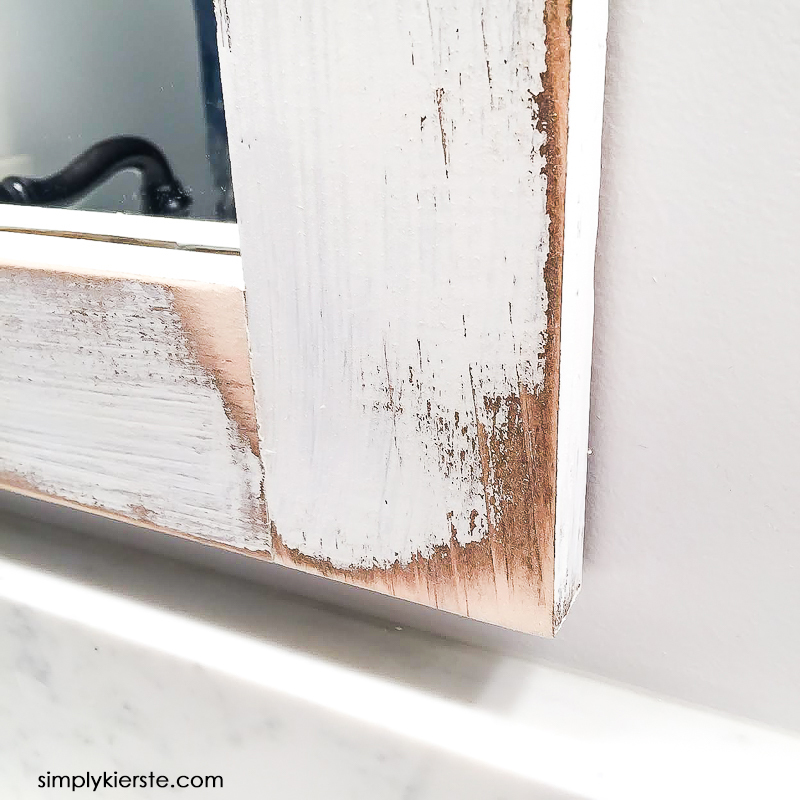 I made frames for four bathrooms–two I left stained, and the other two I stained, then dry painted white, and sanded to get a distressed look. 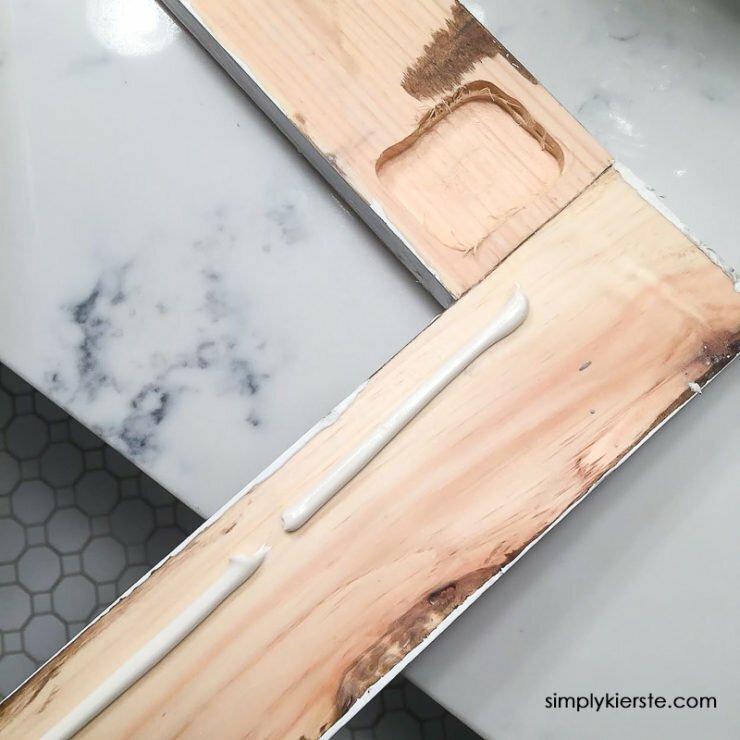 -Use wood glue to attach the pieces of wood together to make your frame. You can use nails too, but we decided not to, because it really was only to hold it together temporarily until we got it up on the mirror. -Hold up your frame directly below where the clips sit, and make a mark. This will tell you where to cut out a section on the back of your frame. In our case it was the top and bottom pieces, but depending on where your clips are, it could be the side pieces. 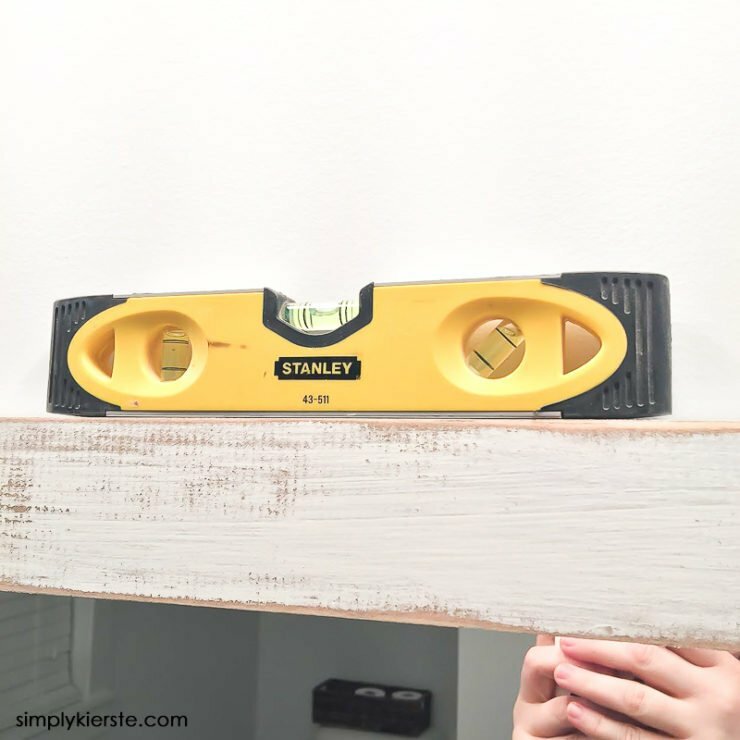 Use a compact router to cut out a hole of the back of the wood, so that it will fit over the clip and flat against the mirror. 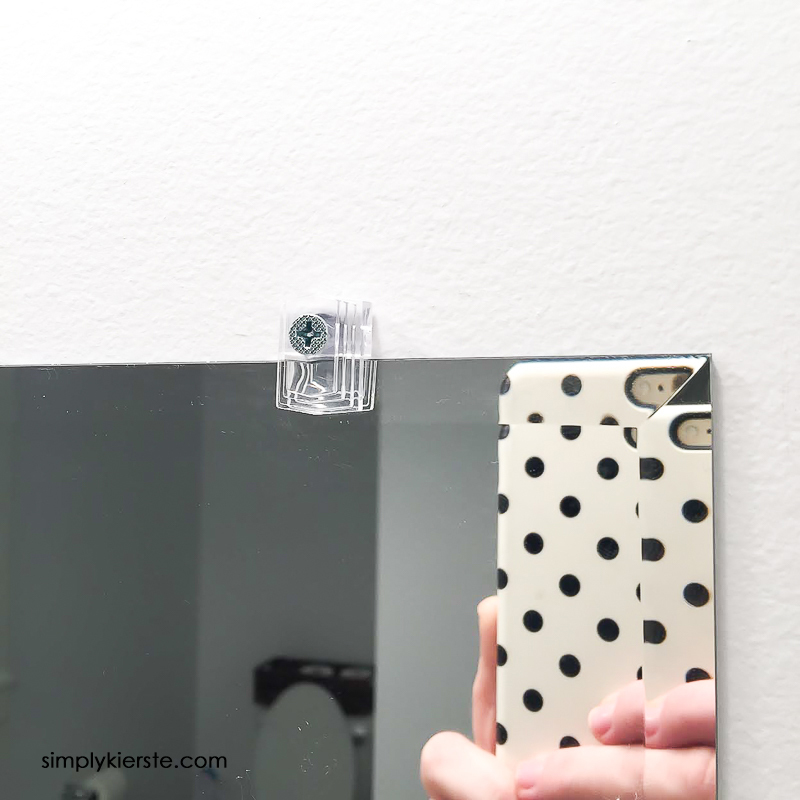 -Attach to the mirror, and quickly check with a level to make sure it’s perfectly straight. Liquid Nails dries fast, and it is not moveable once it is dry, so measure right away. -Hold the pieces of wood in place for a minute or two, then slide a spacer (piece of wood, etc.) between the bottom of the frame and the backsplash or counter, so it doesn’t slide down while it’s drying. Since we’re already here, I thought I’d show you the rest of the bathroom! This is our master bathroom, and we decided when we were designing the house that we weren’t going to make it very big. Big enough, but no more. There is no tub–neither of us care for baths at all–and I’m an in and out kind of girl. Get in, get ready, and out. I would much rather use the square footage in other rooms and in making our closet bigger. Absolutely no regrets at all! That’s the beauty of building–you can build useable space that’s particular to what you like and need. 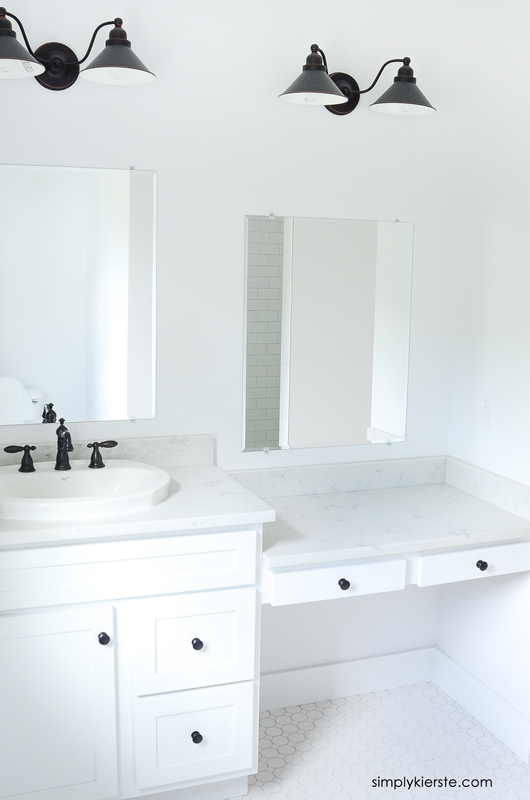 I also went with only one sink, and maximized the counter space. My husband and I very rarely need to get ready at the same time, and if we do, I’m working on my hair and makeup while he’s using the sink space. I’m so glad I made this choice–if I had put another sink in, I would have very little room for my curling iron, blowdryer, toiletries, etc. I love that side of the counter lowered, because I can sit at the stool or stand up. It’s also the perfect space for my little girls to come in and get their hair done! The littlest one still sits on the counter, but the older girls sit on the stool. I love it! Love it. Thanks for inspiring AND sharing the how tos with so many pictures! i love this, however If you glue the frame to the mirror (and over the clips) what happens if you need to take this off the wall? You don’t. :) Or at least you don’t without ruining it. Once it’s on, it’s on, so you need to be sure that’s what you want to do. Wow! I love the way this looks, and the frames look great. 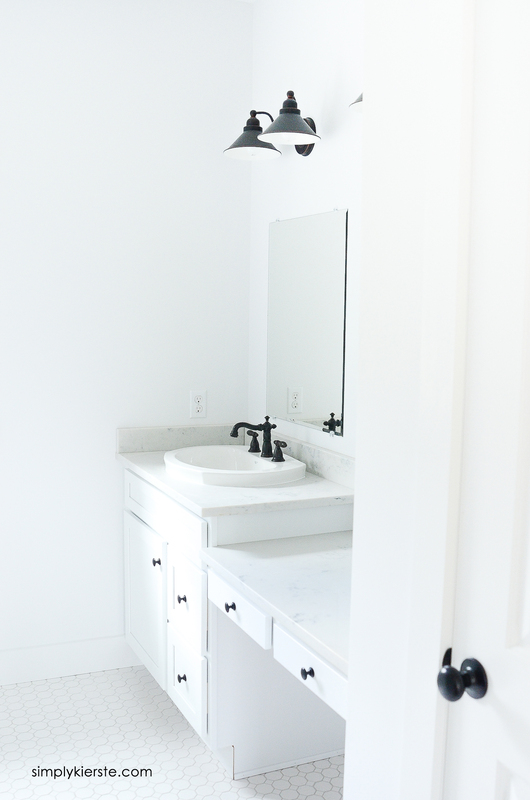 I love the light colors of this bathroom, and how clean the looks are. Thank you for sharing!